Ski boots that suit your skiing style and fit well are worth their weight in gold. 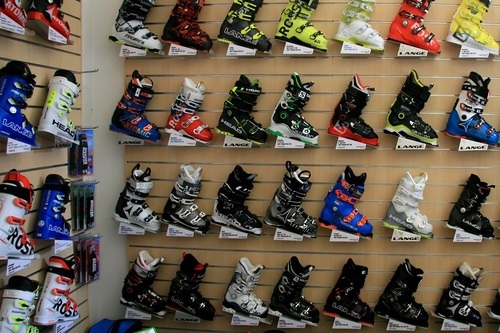 So when it comes to buying your own ski equipment, ski boots should be top of your shopping list. There is nothing worse than having uncomfortable feet when skiing and it really can be the difference between having an amazing holiday or a terrible one. With advancements in plastics and boot shapes there will be a shell that fits your foot no matter how oddly shaped they may be. Gone too are the days of enduring agonising foot pain in order to get decent performance from your ski boot. These days boots are completely custom mouldable to your foot shape and will still offer fantastic performance. If you are a less confident skier or maybe one that just likes to ski from bar to bar then it’s all about comfort and warmth rather than performance and this is certainly possible to achieve. Once you have your new boots take them home and wear them for long periods making sure that you flex them to see if any problems arise. Most shops offer a comfort guarantee so if the fit isn't right go back to the shop and ask them to adjust your ski boots. Often only the smallest change can make all the difference. Don’t just assume they are ski boots and will always be painful, this is not the case. When you put your boots on to go skiing don’t crank up all the buckles straight away, this will lead to pain and loss of sensation. Do them up loosely at the start of the day and then only when you are ready to ski tighten your buckles to get that performance and limit any movement. As you warm up you may need to tighten them further. However, the instep buckle should only ever be 'finger tight' as the top of your foot is bony without much fleshy protection. Too tight here and you might prevent blood circulation or trap a nerve which can be very painful - often the culprit for boot issues. If you feel you have to do up the instep buckle really tight to get the performance you need then there is too much space inside your boot and you require a boot with a lower instep. Don’t always put the boots on the same settings - many factors can change the tightness so always tighten them by feel rather than putting them on certain clips. With weight loss or gain your foot could be a different shape compred to the last time you went skiing. Temperature will also change your foot and the stiffness of the boot's outer plastic. If you have had a baby this can change your foot shape massively. Invest in custom moulded insoles or foot beds. The human foot evolved to walk on an uneven ground surface. However, with the development of pavements and flat unsupportive shoes our feet are now often very unstable. A footbed will stabilise your foot. This not only avoids potential comfort issues but will also increase the ski boot's performance by allowing movements of your feet to be transmitted more efficiently to the skis, giving you extra stability and confidence. A good pair of well fitted ski boots is a great investment for any self respecting skier. Don't choose a ski boot based on its looks – your foot chooses the boot not you. “I want this one because it's pink” is a big no no! Do keep your ski boots in a warm place overnight. They will be so much easier to put on the next morning. Don’t leave your boots outside, or on the bus, or in the bar. No one likes cold, stiff, wet boots in the morning. Do dry your liners if you can. Don't be that guy in the boot room stinking it out for everyone else. Do invest in some quality 'wicking' ski socks – dry feet are much better than wet. Don’t over tighten your ski boots, especially on the instep buckle. Do store your boots with the buckles done up to hold the shape of the boot – especially with moulded ski boots. Don’t put your boots on the wrong feet. It's been done before. Don't tuck your ski pants into the top of your boots. This looks ridiculous as well as being uncomfortable. Do enjoy your skiing as much as possible. Comfy feet = massive grin. Plenty of space in the forefoot and over the instep. Has a rubber side allowing the side of the boot to move as the foot changes in shape with temperature and transmitting force to the ski, to make it much more comfortable for people with wider feet. Only two buckles so this boot is more about comfort than performance. Slightly lower volume on the ankle. Soft liner, warm and comfort orientated. This ski boot comes in a variety of stiffness’s depending on the skier's ability and weight. These ski boots are like huge buckets. They can be stretch and modified to fit truly enormous feet. This is the 'go to boot' for people with huge feet who often struggleto find ski boots in their size. High volume all over - forefoot, ankles and calfs. The womens' model has extra adjustment in the calf area. This ski boot comes in a variety of stiffness’s depending on the skier's ability and weight. For the very low volume foot these boots have a narrower forefoot, low instep and tight ankle. They are fully custom mouldable and the width can be changed up to 6mm. For women the smallest size is 22.0 but many boot fitters will use a 23.0 shell and just put a smaller liner in. This ski boot comes in a variety of stiffness’s depending on the skier's ability and weight.